Centuries before you started building snow forts in your backyard, the Inuit had mastered using snow as construction material. This 1949 video, produced by the National Film Board of Canada (and with narration that uses some outdated terminology), illustrates how exactly people native to the Arctic can erect warm, temporary homes using nothing but a knife and the snow beneath their feet. The artifact was spotted by The Kid Should See This. The igloo (or iglu in Inuktitut) in this footage takes around 90 minutes to erect, but a similar structure can be built by a skilled person in as little as 40 minutes. To put together the shelter, the two men carve up firm, packed snow into blocks that are about 2 feet tall, 3 feet wide, and 4 inches thick. After the first row of blocks is placed in a circle on the ground, the builder slices a section of the blocks to create a slope. Each row that's placed on this foundation will spiral upward, creating a shape in which the blocks support their own weight. By the time the keystone block is fitted into the top, the igloo is strong enough to support the weight of a man. The final steps are carving a doorway out of the bottom of the structure and plugging up the cracks with additional snow from outside. Even on a frigid Arctic night, the temperature of a well-insulated igloo can reach 40 degrees above the temperature outside. And the warmer the igloo gets over time, the stronger it becomes: The heat from the Sun and the bodies of the inhabitants melt the outer layers of the blocks, and that water eventually freezes to ice, giving the home more insulation and structural integrity. 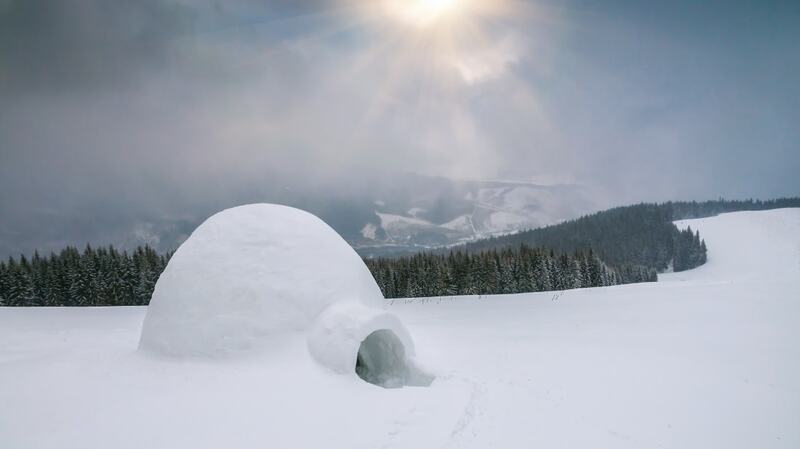 If you aren't ready to build an igloo, here are some less intimidating snow projects to tackle this winter.